“The Verde Park project is an excellent example of the partnership between the university and the city of Phoenix. 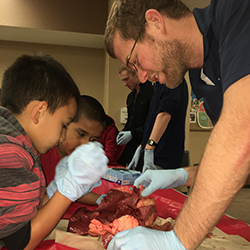 It’s a great teaching opportunity for our students to learn about community health.” — Stuart D. Flynn, MD, former dean of the UA College of Medicine – Phoenix. Last year, the College and the Phoenix Parks and Recreation’s FitPHX program got together to figure out ways to bridge the gap between the Campus and Verde Park, which is located only a few blocks away. The result? 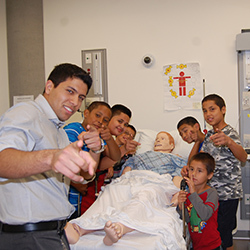 Wildcat Night @ Verde Park, a monthly program that enables UA College of Medicine – Phoenix students to give back to the community by sharing health and wellness lessons with local youth. Each month, medical students visit the park to teach topics like how the heart works, the importance of good nutrition, chest compression-only CPR and the dangers of smoking. Altogether, 229 kids from preschool age up to high school and about a dozen medical students participated in the first six sessions, and that number only continues to grow. For more information, contact Allison Otu, 602-827-2452.